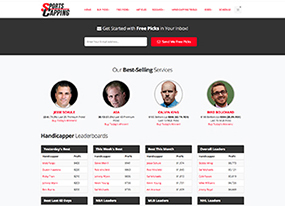 When a site bills itself as the "World's Best Handicapping Platform", we had to check it out. Staffed with the "Best Sports Handicappers", SportsCapping offers pay-for picks to help bettors do their best to make smart wagers. Since 2003, SportsCapping has provided expert analysis and betting information that (we hope) people have been able to turn into winning wagers. The goal of the SportsCapping staff is to foster trust with the people they're providing picks for. The handicappers on their site have different backgrounds when it comes to sports betting, but each has been thoroughly vetted to ensure they're devoted to their craft. An added bonus of SportsCapping is that they assign the same value to every pick entered on their site (100 units per pick). This is a time saver because you don't have to do any extra math (which is never fun, thumbs down to math!). SportsCapping is a great sports handicapping resource but it's important to note that they are a reseller of picks and their premium services aren't free. However, there is a section on their website devoted to free picks but it's only the picks you pay for that come equipped with expert analysis. With many sports available (NFL, MLB, UFC, NBA, NHL, college football, soccer, tennis, NASCAR and more), you have options to get picks for your favorite teams on any of their particular matchups. Some subscriptions services charge by the sport but SportsCapping gives you the option of buying picks for the day, week or month. The Daily Pick price ranges from $20 -$75. The Weekly Package is priced at $125-$275. The Monthly Package ranges from $350-$600. All prices are in USD. At SportsCapping they do not make any outlandish guarantees or provide unrealistic picks. Overall losses are occasionally compensated with a free subscription offer to help you recoup some of your lost cash. Should I Subscribe to SportsCapping? If you have some extra dough burning a hole in your pocket, singing up for SportsCapping's pick services isn't a bad idea, especially if you're a novice bettor. While not all of their picks are going to net you major coin, you could find yourself on a winning streak based on their analysis and expertise.